Then I thought of St. Patrick’s Day, and drew and coloured some little shamrocks for a fun effect. 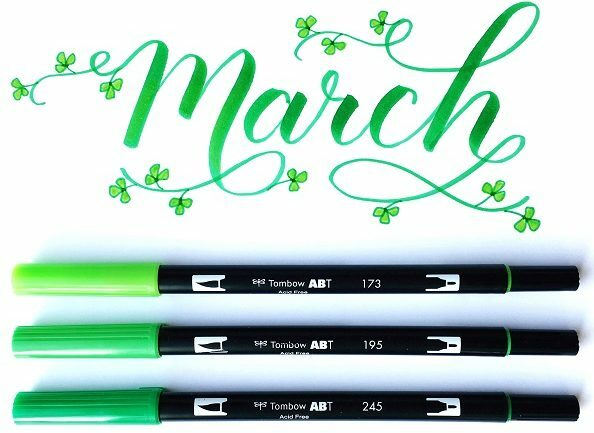 Because the Dual Brush pens are double ended, I used the bullet nib instead of the brush tip for the shamrocks. If you would like to download and print this, click HERE or on the photo below. You will be redirected to the pdf that you can download and print on 8.5 x 11″ copy paper. The MonoTwin is a permanent marker with two ends of different sizes of bullet nibs, and I used the .8 mm tip to draw the flower. The ink is quick drying so you can use it with the waterbased markers and not worry about drying time or waiting. Love it! The third lettering design created with my Tombow pens is the word ‘lucky’, which I posted on Instagram as a video. This technique is called “faux calligraphy” and is a wonderful way to achieve some fun calligraphy effects without the precise execution of a brush pen. Anyone can change their cursive into calligraphy using this method. 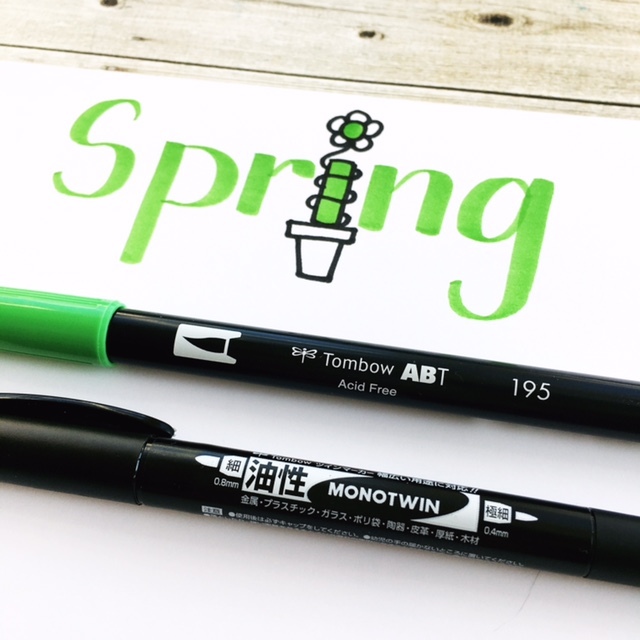 I always use Tombow Mono Drawing pencils and my Tombow Monotwin Permanent marker for this technique. If you’re interested in shopping for Tombow pens and pencils, here are some affiliate links that will redirect you to the Tombow website. Just click on the photos to view the products in the Tombow website store. I love working with my Tombow markers. I’m always interested in the color combinations other artist have worked with. Would you please give us the numbers of your ‘rainbow’ markers in this post. You make it look so easy Kelly. I love calligraphy and used to do it a bit years ago. I am happy to start doing it again and you are a great teacher. Love watching your video’s!! You have a great voice for them. Thank you Sue! I love teaching and sharing videos online. Hi.. great video! Can you tell us how you store your Tombow markers? I threw the original stand away as I was always frustrated with trying to get the markers in straight. Mine are now in a pencil case and it works pretty well, but would really like something that stands up.. ideas? Thanks! I use a Deflecto 6 x 6 clear plastic desk storage box. It can be upright or on its side. Great for the Tombow pens or other pens too! Hi again.. are you able to get all 96 Tombows in one of your Deflecto 6 x 6 clear plastic desk storage boxes? Thanks! Yes Martha, you can get the whole box of 96 Tombows into the Deflecto 6 X 6 storage desk box.